Tyree Transformers recently designed, manufactured, delivered and installed new power transformers and traction rectifier transformers for a major upgrade of the Chalmers Street Substation which is located next to Sydney’s Central Station. The Chalmers Street Substation upgrade was a project completed under the Transport for New South Wales (TfNSW) Power Supply Upgrade (PSU) program to enhance the electrical system, to support the introduction of new smart air-conditioned passenger trains and to cope with continued increases in passenger volumes. 3 x Rectifier Transformers traction class rated at 5,350KVA, 33KV/600V/600V with ONAN cooling. 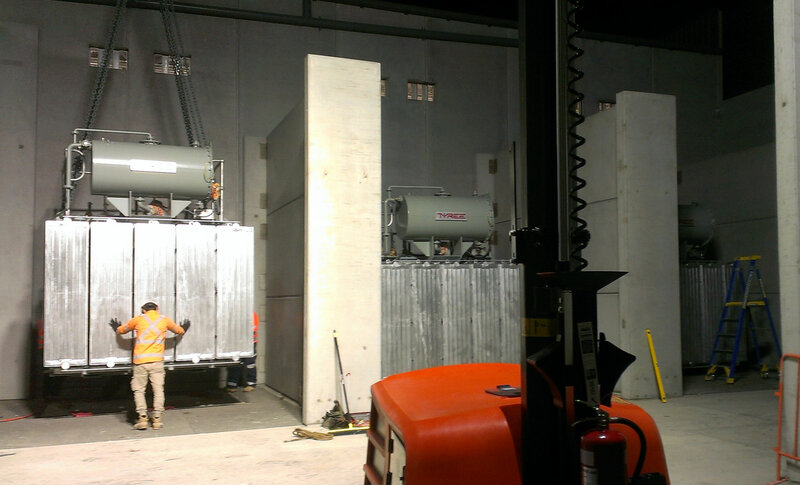 As part of Tyree’s scope of supply our Field Service team were required to complete the delivery, unloading and site positioning of the transformers within the Chalmers Street Substation. Access to the Chalmers Street substation site is very constrained as it is located in a heavily developed area of the Sydney CBD and next to the largest train station within the Transport for New South Wales rail network. There are significant traffic constraints for over dimensional load movements within inner-city Sydney and surrounding Central Railway Station. These transport constraints, added with the need to maintain power onto the nearby train corridor, required the delivery, unloading and installation of the transformers was completed in the early hours of the morning (whilst the City slept) over two days. The Tyree team completed this installation process on time & on budget with no disruption to train movements. For more information about this project and other Tyree Transformer’s products and services please contact our sales team on +61 2 48726177 or sales@tyree.com.au.